Joe Schmutz recently wrote an interesting article about the decline of sharp-tail grouse numbers in his home province of Saskatchewan. Joe was kind enough to give me permission to share it on my blog. Thanks Joe! In 2013, the Ministry of Environment responded to declining sharp-tail grouse numbers by reducing the daily bag limit from 3 to 2. There was a time when the grouse were so numerous they were taken for subsistence without a bag limit. Then, in 1985, the existing limit of 5 was reduced to 3; now 2. If this trend continued in a straight line, the limit would be 1 in a dozen years and sharp-tail hunting closed in 2040. What would it take to reverse that trend? When the Ministry announced the reduced bag limit, they called on hunters, naturalists and landowners to report observations. Of course, isolated observations only go so far. What grouse need most is action. Having hunted sharp-tails, and other upland birds in Saskatchewan for many years, I believe that severe winters and wet and cold weather during early summer brood rearing can cause ups and down in grouse numbers. But, I've also observed loss of habitat that is always a down. I decided in 2013 to respond to the Ministry's call and record number of hours hunted, grouse seen and bagged, GPS locations and food found in the grouse's crops. I have hunted grouse in various parts of parkland edge (northern grain-belt) in the western half of the province. In good years, I've found grouse in decent numbers in small grassland patches such as abandoned farmsteads, shelter belts and sloughs surrounded by cultivation, as long as larger grassland areas were nearby. The large grasslands held grouse more reliably and that is where I went in 2013, to community pastures. In 14 hunting forays over 7 days and out of 20 hrs hunted with 2-5 dogs, 1 saw 137 flushes, 7 per hr. Twenty of these birds, I figured, had landed and were flushed a second time. This left 117 individuals of which I bagged 12, 10%. I hunted over new areas each time and likely encountered different individuals. The age ratio was 4 adults and 8 juveniles. l used Large Munsterlander dogs, a versatile breed with medium range and speed. I estimated area covered by observing that the dogs covered approximately 150 meters on either side of me. This yielded a density of 9.5 grouse/km2. A more detailed report has been submitted to Nature Saskatchewan's journal, the Bluejay. As the Ministry's press release rightly states, wide research had been done on sharp-tailed grouse - Saskatchewan's provincial bird. The last detailed studies were by Wayne Pepper and Adam Schmidt decades ago. Surveys done by conservation officers remain largely unanalyzed. My calculated 9.5 grouse/ km2 was among the highest densities I could find anywhere. It proved to me what I suspected all along. When you give the grouse the habitat they need, they do just fine. So, what habitat do they need? The recently eaten foods found in the crops of grouse also tell the habitat story. By total volume of all crops, 21% was grasshoppers, 59% fruits, 19% wheat & canola, and 1% buds. These foods were taken from late September to early November, and illustrate changes in habitat and food through fall. In summer, grasshoppers and other insects are a high protein favorite. After the first few frosts when grasshoppers disappear, nutritious berries are a staple. Once the young grouse can fly well, the hen leads them to surrounding fields for grains. Through the winter; all available dried and frozen fruits are finished off, and shrub and tree buds become a staple - that's when hunters often see grouse up in trees. This change in food shows the impacts of habitat loss too. When grasslands are cultivated, all or most of the grass and shrub cover disappears. Grasshoppers may be available in crop borders, but if these are sprayed with pesticides they can harm the grouse, especially the young. Grains and weed seeds are nutritious, but when these are covered by deep or crusted snow, the grouse can't reach them. This is when sharp-tails switch to tree-buds; something the introduced grey partridge and pheasants do not. Watching the dogs use their noses to work scents left behind by grouse can help us understand what grouse need for protection. Except for spotting flying grouse or marking a shot grouse fall, dogs use scent to locate the birds, not sight. Mammalian predators likely do the same, while raptors use sight, a grouse that crawls under a dense matt of grass where the wind is still, can be very difficult to find for a dog; or a fox. This dense grass cover is also important for a hen whose nest she needs to hide for as long as 40 days: 10 days for laying, 22 for incubation and 7-10 more before the grouse chicks can fly short distances to try and escape. Every grouse hen has to count on luck that no weasel, skunk, fox, coyote or farm cat walks by so close that she has to flush and reveal her nest or brood's location. The ranchers use the pasture for summer-to-fall grazing near water sources. The rest of the pasture without standing water becomes their "grass bank" in most years. The ranchers know that in Saskatchewan dry years happen every so often. Instead of buying feed, which is even more expensive in dry years, they store some grass. When this grass is needed they can take water by truck to those areas and let cattle use the native grass that may be old but still has some forage quality in it. This grass-bank grass is mixed with some new growth. Some new grass will grow even in a dry year where the soil has been shaded and dead grass held needed moisture. It is no accident that I found high numbers of grouse here. The grouse know that their survival depends on grass, and so should we. Eighty percent of the grouse's prairie habitat has been altered for crop production, municipal services, resource extraction, transportation and the like. Of the 20% that remains, much is in the southwest, the dry sage grouse country where sharp-tails tend to be less frequent. Also, much of it is used for season-long grazing, if that is what the ranchers prefer to do. The greatest hope for grouse hunters lies with community pastures, the federal and provincial variety that makes up 4% of prairie. Here the ranchers and pasture managers could be the grouse hunters' allies. Sure ranchers know to look after grass and grow cattle, but managing for cattle alone, or cattle and grouse together, are slightly different ways of managing grass. Recently, the PFRA pastures that have been managed for decades to the satisfaction of farmers and hunters have been put up for sale. Were the cattle industry in better shape financially they'd be gone. Other big-money interests have offered to buy them, and they're just waiting. This is the hunters' high time to get involved. What I'm describing is for that last 4% of prairie to be held in the public trust and used for grazing, but also with a multifunction-arrangement in mind. For this we need to bring key parties to the table, including the provincial government, producers, industry, conservationists and hunters. Jointly we can develop a win-win solution that ensures continued public ownership and sustainable management of our pastures for the benefit of all Saskatchewan residents. It's been the mixed farmer primarily who used community pastures. When the grain operation on the mixed farm got busy, the cattle went to the pasture where the pasture manager looked after them. At the same time, the pasture manager made sure that oil and gas disturbance was kept to a minimum, hunter access was managed, grazing was adjusted to fight back invasive species, and the bulls, fences and windmills were looked after year-round. These guys see things in grass from their horse that goes over most of our heads. These pastures can be the ace in the hole for grouse hunters and naturalists. We can stop the relentless erosion of grouse bag limits, we just need to decide and come together on it. Sure we need to save money where we can, but not trade grouse for an uncertain heritage fund. The pasture manager's salary has come 50% from pasture patrons and 50% from the public purse for public benefits that were estimated by economists to be 2.5 times more than costs. I'm happy to let some of my taxes and hunting license fees go to paying pasture managers. More importantly, the oil, gas & gravel royalties that come from pastures but go into the government's general coffers are huge. 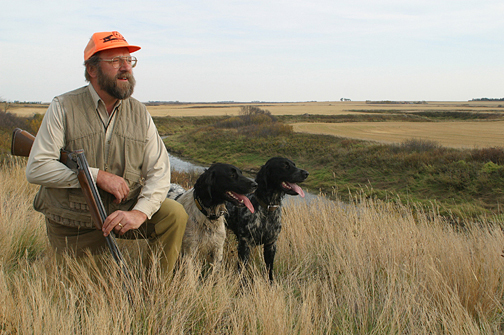 Are we so poor in Saskatchewan that grouse hunting has to go? Will deer be next? The so-called pasture transition is not going as smoothly or quickly as was hoped. Conservationists and naturalists have asked some serious questions (e.g. http://pfrapastureposts.wordpress.com/) and especially the pasture patrons have asked to be heard (see: http://www.cppas.co/) Where is our government's leadership? Bag limits are the environment ministry's responsibility, pastures belong to agriculture. It could be our government's legacy to create a Heritage Rangelands division, or something, to bring the many interests to the table while we still can. The majority of pasture patrons want to keep the pasture managers and we hunters should help them succeed. Even if I personally will be unlikely to hunt grouse in 2040, let's make sure own kids still can.